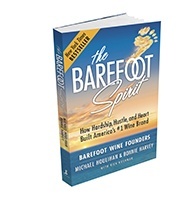 Michael Houlihan and Bonnie Harvey co-authored the New York Times bestselling business book, The Barefoot Spirit: How Hardship, Hustle, and Heart Built America’s #1 Wine Brand. The book, chosen as recommended reading for the CEO Library in CEO Forum, chronicles their start in a laundry room in 1986 and creating a nationwide bestselling wine label. 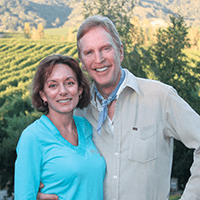 With virtually no money and no wine industry experience, they employed innovative ideas and strategic alliances to overcome obstacles and create new markets. They pioneered “Worthy Cause Marketing” and performance-based compensation with a comprehensive view of customer service. In 2005 they successfully sold the brand to E&J Gallo. Since then, Michael & Bonnie share their experience and innovative approach to business as authors, keynote speakers, corporate trainers and consultantants with Fortune 500s. One of their clients made the Inc. 500 list for the second year in a row. They are sought-after workplace culture experts in both print and broadcast media with hundreds of interviews and articles in professional and national publications. They are the recipients of the 2014 Distinguished Entrepreneur Speaker Award from the Turner School of Entrepreneurship and Innovation at Bradley University; and keynote speakers for 2014 SOCAP Symposium (Society of Consumer Affairs Professionals in Business, 2014 World Conference on Entrepreneurship (ICSB) in Dublin, Ireland, and C-Suite Conference. Michael & Bonnie speak throughout the country and internationally to corporations, conferences, universities and symposiums. Business leaders and professors of entrepreneurship highly recommend them as inspirational speakers and entrepreneurial thought leaders. Their new book The Entrepreneurial Culture, 23 Ways to Engage and Empower Your People will be featured in Jeff Hayzlett’s C-Suite TV Network launch and C-Suite Book Club. – Jeff Stevenson, Founder and CEO, VinoPRO Inc.